Oh my goodness!!! 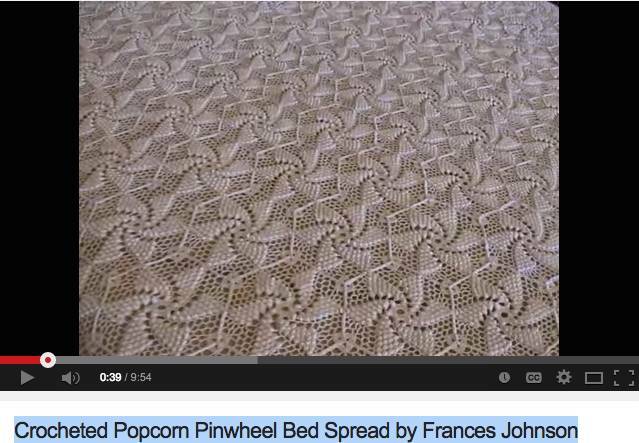 Isn’t this the most absolutely gorgeous bedspread, story, and video you have ever seen? 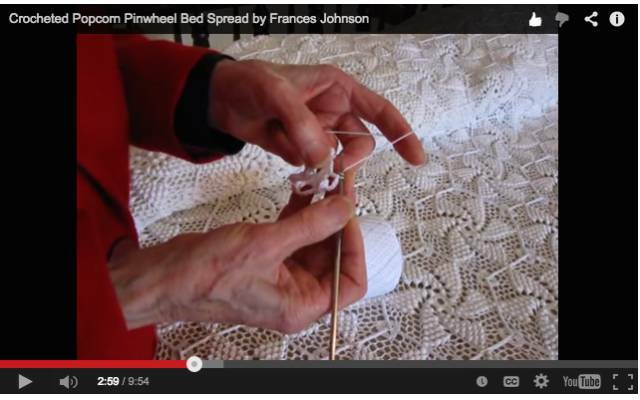 Since she has given us the pattern, I think that this just might be an upcoming challenge — to reproduce 1 pinwheel . I can hear the video, but can’t see anything. Did she do this in thread or yarn? In either case, what size did she use? What size is the hook? weird that you can’t see it. yah it is, isn’t it! When I go to the antique stores and see crocheted bedspreads I feel sad, thinking of the families that no longer wanted them (or knew what they were, what was involved). My mother has one half finished that is Very complicated. She always wanted me to finish it for her, but I don’t feel capable. And, I may be lazy, and wanting to do my own projects. maybe do some of it and then pass it on to someone in the next generation .. wouldn’t that be cool? A 3 (or maybe 4) generation quilt?!! I don’t see any future crocheters around me. It’s an awfully complicated pattern, using light string and a #1 steel hook, tiny tiny work. It really puts me off even thinking about it! But the ‘generational’ thing Is a good idea. how much of it did your Mom get completed? isn’t that fascinating how the parent-child relationship continues.